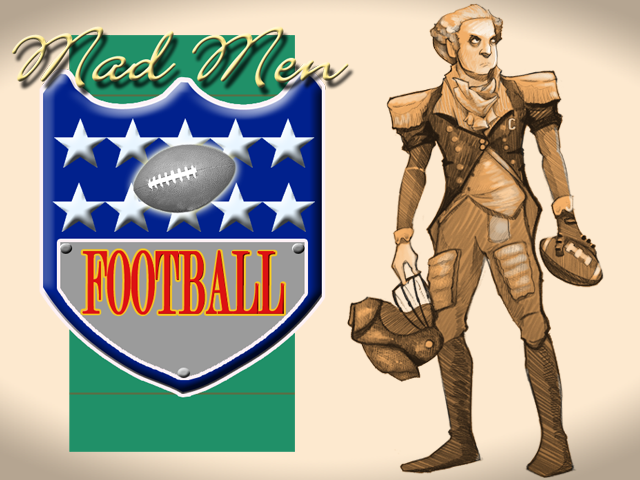 AE Games, for the first time, is publicly announcing its first title in development, Mad Men Football! What is Mad Men Football, and the idea behind it? Mad Men Football is a retro-styled American football video game with a historic twist, being developed specifically with the Wii U in mind! Mad Men Football is taking historical figures and groups from battlefields, and putting them on football fields! Many of the historical figures and groups in the game may have used swords, cannons, and rifles to win battles in the past, but now they will be "battling" to win on the gridiron! Instead of George Washington firing shots at his enemies' heads, he'll be firing passes over their heads. Mad Men Football is being self-funded right now (no Kickstarter type campaign, unless there is a great request for it), and development started on it in 2013. The goal is to hopefully release Mad Men Football as a Wii U eShop title later this year, in the United States! 1) What about past development experience? A young adventurer was once told, "It's dangerous to go alone!" The same can probably be said for game development, "It's dangerous to develop alone!" As a developer first, and not an artist in the least (if that hasn't been figured out already), it would be insane for me to think of producing Mad Men Football without getting help from others. It's why finding an artist was something I wanted to do early on (and did), and have even approached a voice-actor. 2) The development/programming of the game is what is being concentrated on at the moment. Finishing team playbooks, player routes, and the passing mechanics. 3) Being a self-funded project, and as a developer first, the art and animation will be done by an actual artist/animator (and everybody cheered!). 4) The voice-actor that has been contacted, is a professional voice-actor that has provided voice-overs in games. What's a football game, without an announcer? 5) The studio name. Like many indie developers, being that this is a self-funded project for now, the goal is to concentrate on making the game first and using funds to get it released. The studio name may change once we file the official paperwork (have seen lots of positive and negative comments on it though! ), but some might have guessed the reasoning behind the current "name" from the initial press release (and maybe even more so now with the first game known). 6) Do you have Wii U SDKs yet? The necessary forms have already been filled out with Nintendo. Development is continuing on the project, as I have heard it can take a little while for a response (sometimes a few months?). So unfortunately, no, there's no unprecedented partnership to announce at this time. 7) Why the site, and press release this early? As some noticed, the site was setup earlier in January, which was done as a placeholder. With the continued bad news from third party developers in regards to the Wii U, I thought that this week with Valentine's Day would be a great week to try and get some good news and encouragement around the Wii U going. Which is why the press release also included the information about using the hashtag #WeLoveWiiU. The press release and announcement are definitely a lot earlier than was initially planned though. And I had no clue what I thought was a simple press release, would turn into the firestorm it did on so many different sites. 8) Is this a hoax? No. And I will probably be releasing screenshots from the prototype in the next few weeks, but I didn't want people to get discouraged at the art assets I'm using (if you can call MY assets art). If anything, the screenshots will show the basic assets that I have been using, as I have programmed plays, and made sure that players (receivers) follow the right paths. Thanks to everybody again that sent emails, and words of encouragement since the press release on Monday. Also, for those wondering about the site, being that I wasn't originally planning this for this week, is one reason the site is on Blogger. I actually have another hosting site, and it is currently just redirecting to Blogger for now. The hosting site is where the final website will be designed, and it also allows for real email accounts associated with the domain. There have been some sites asking about potential interviews, and I will update this post with any interviews done in regards to the game/development/myself with the links to them below, if any are still interested. Any interviews done may also answer other questions, that haven't already been answered. Looks interesting, guess you guys are legit. Glad to see you guys aren't just a hoax. That teaser image was pretty bad though, lol. The game sounds like it could be interesting, I'll keep my eye on it. Interesting concept for a game. I don't know anything about US sports or history and it personally doesn't appeal to me. But I'll keep an eye on your development of it regardless (If legit). Hopefully you get some success with it. Ohoh. Well that's nice. Hope you guys find success. And then every one of us who cried "trolling" were served crow. I will say that I don't think that anybody was expecting this, and it is a unique twist, in a way. But themes aren't necessarily twists. I personally feel that twists should be reserved to gameplay mechanics that reflect the theme, instead of just calling something different from the rest just because it looks different (or has a different story). Also, some advice: While the font for your logo is fine, drop all the bells and whistles in it. The most important part of graphic design is communicating a basic message as clearly and simply as possible, especially for a logo. Business logos must work in black and white, as a general law of graphic design, and the glow, soft shadow, and glare effect in yours break that law. If you look at other logos, even from other indie companies, you'll see that they're either two or three-toned. You'd do well to apply. I wish you the best of luck in your endeavors, however, and despite what I said about twists earlier, I believe working on a simple football game is a smart move for a studio that's just starting out. We'll all be watching to see how you bloom. So will it play like Techmo Bowl? Or more like a strategy game like Blood Bowl? Baseball Stars is an awesome game along with the sequel. Good call, but I'd also like to see a survival horror and a 3D action-adventure RPG adventure too. Amen. Need it to come to the WiiU VC. Hope about the Thursday before opening day. that would be awesome. not sure who owns the rights to the SNK games though. A retro American Football game starring retro American heroes. Smells like freedom to me. I pledge my support (AE) for your very first title. As a new company and first title going to the Wii U, you earned that. Don't let me down AE (Words of encouragement). Does this mean it's only released in the USA? Doesn't the eshop cater to all of North America? Why did you specify the US? Nice concept. I'm not from the US, but it certainly looks appealing. I'll be cheering from the sidelines. Sounds like an awesome idea! I would suggest try and make it unique though, don't just stick to normal everyday football stuff by make it over the top crazy. Just as an example perhaps George Washington as a quarterback loads the ball in a cannon and fires it down field for a pass. Come up with wacky and innovative ways to make this game a unique experience and you will be certain to get my dollar as well as many more! Please release this on the European eShop store! :D Seriously... they didn't even release any Madden games for Europe and I need my fix of some football. :p Thanks. Well glad to see you guys were indeed legit and not a hoax, your George Washington drawing is a lot better then the other images you have shown us lol. While I am glad you are legit...gotta say I have no interest in this, but glad you targeting the Wii U unlike a lot of others. To be fair it seems kinda pointless to make a really nice, professional high quality teaser picture lol. The game is all that needs to be good. It's missing US flags, guns, trucks, pies, turkeys, eagles, and beer; but otherwise, it still looks like 'Murica. Glad you found it interesting, and thanks for the comment! Thanks for the comment! Hope you like what you see in the coming months. Yeah. And, didn't want to make it very obvious. Thanks for the comment! Thanks, and I do understand certain sports are more popular in certain regions/countries. Hopefully though, you will like what you see in the next few months, and maybe it will even make the game appealing to you! I'm not going to divulge much. But there is already much written down, and much that has been experimented with in terms gameplay mechanics, based on the theme. I agree, that themes themselves are not necessarily twists. But, if they can be incorporated with proper gameplay elements, the theme behind it could/should have much more appeal. Glad you think the concept is interesting! Goes the cannon, from the clue/hint piece? I could release a current screenshot of the running version, but the artists and graphical designers have already had enough disappoint for the week! And, hopefully you will like what you see in the coming months! You're quite welcome. I look forward to seeing how your project will flourish. BO JACKSON COMING IN HOT. Sorry, I specified the US, because I'm US based. No worries! As I mentioned in the post, "for those wondering about the site, being that I wasn't originally planning this for this week, is one reason the site is on Blogger. I actually have another hosting site, and it is currently just redirecting to Blogger for now. The hosting site is where the final website will be designed, and it also allows for real email accounts associated with the domain." out of curiosity after this game what kind of game can we expect from you guys next? AE, so would this be somewhat of a Tecmo Bowl style game? I also wonder what other genres you are having in mind for the other future titles as well. Sure, and that was specifically addressed, "The hosting site is where the final website will be designed..."
And, AE does not equal EA. Mad Men Football is three separate words, not two abbreviated. And it does not, and will not ever have the NFL license. :) But it does have the word "Football" in its title, which the other one you referenced doesn't. I'm not sure what your expectations were from the initial press release though, as it clearly stated "AE Games is a brand new game developer...", as the very first line. And I do agree that hyping something that isn't in the works wouldn't be the right way to go. Work started on this last year, and there is a current running version. But I haven't hyped any features, play-style, graphics, release date, price, or anything else. Just basic information about the idea behind it, and that work has started on it. I also couldn't control how sites titled/spun the press release. I mean, it could have also been titled, "A new game developer announces start, and talks about the sad state of some Wii U third party support." Maybe that wouldn't have caused the firestorm that it did on so many different sites? And if you read the points above, they addressed some of your other questions as well. Yup. Always nice to chat with a fellow new dev. I can make the same logo on Photoshop. I want to see real pictures of your game to believe in your project. I'm still skeptical about you even getting the nintendo dev license, but o well, good luck i guess. What you say when you see so an fan wallpaper? A Upcoming Wallpaper to 2015. This has the potential to be the new NFL Blitz or just have the potential to be the series that can take Football outside the usual Madden rehashfest and make it fun again. It's no big deal one way or the other. I find people who sit around on the internet calling game announcements "hoaxes" are mostly pathetic losers with no lives anyway, like what you'd find at OperationSports for example. I wish the developer well. People who bring beef across internet comment sections and double post it aren't pathetic losers though, right? People who sign up with new usernames like "see through you" just to make slick backtalk sure aren't worthless morons who catch feelings over a comment like a fragile woman would, right? People who post with unregistered usernames like "see through you" because they lack the balls to use their regular registered username, just so they can make "smart" (read "smart" as "dumb") backtalk because they think it makes them look cool, sure aren't worthless morons who catch hurt feelings over a comment like a fragile woman would, right? P.S. I've brought no "beef", I just stated a fact at PastaPadre, and I stated it here, too. Unlike some weak-hearted posters, I'm not hiding my username. You can say whatever you want to me at either place, just make sure you be a man next time and use your regular username so we can know who you are, Nancy. TBH there is not actually a real proof that they are legit, until we see some actual gameplay, anyway, i don't think this game will be very well received outside the us, there are 5.7 million wii u sold so far, how many of those are on the states? (i know for a fact that most of the consoles are located in japan), that's your "at most" market, what is nice for you is that apparently have (to the date) close to $0 operational costs. Anyway as i told you before, good luck, but i still doubt of this guys! P.S. I've brought no "beef", I just stated a fact at PastaPadre, and I stated it here, too. Unlike some weak-hearted posters, I'm not hiding my username. You can say whatever you want to me at either place and we can address it, just make sure you be a man next time and use your regular username so we can know who you are, Nancy. Oh, this is so very sad. Complains about anonymous username while using the handle "Iown You". Acts like an internet tough guy while using the handle "Iown You". This is a parody of a real person, it has to be. It can't be real. Just so you know son, since you name-dropped a place it's pretty clear that you've brought beef from there. I don't know what they did to hurt you, but just let it go. Holding on to it like this isn't healthy. If you are in fact a real person, I think you'll realize this in time. Bonus points for the misogyny. You really showed your true self there. That's certainly a trait that other human beings find attractive. I'm sure it will serve you well. "John Garland" signs up, makes his first post EVER online with that username (check his stats), and it just so happens to be here and about THIS? LOL! Whatever "see through you", you're not smart enough to pull it off. No one is being an "internet tough guy" (WTF are you talking about?). What a dumb comment, smh. You're clearly some sniveling moron from one of these sites, OS most likely, and you want to cry because you got called out for being the ignorant piece of trash you are. WAHHHHH, WAHHHH. You big baby. Cry me a river. Don't like my comment? Tough. Get over it. I mean, what kind of a moron keeps making a deal over a guy saying he doesn't like something about a WEBSITE? LOL. What a failure you are. P.P.S. Way to thumb up your own post. Yeah, you're a winner in life... you can take that thumb and stuff it up your own a$$, too, you nothing piece of garbage. Iown You, you have clearly shown you don't know what misogyny means (which is amazing, since you have google at your fingertips). It was my exact thought when I read your original response. "...like a fragile woman would..." My thought was exactly, "I wonder if he feels all women are fragile?" Now don't get angry and beat your wife - standing over her with your fists clenched, making her into a "fragile woman" (yes everyone, I gave him the benefit of the doubt and assumed a woman has actually been tricked into marrying this chauvinist). This is only an internet comment. P.S. Notice how I used my real name to make this comment, Mr. you? P.P.S. Like the way I imitated your "awesome" post-script style because I couldn't find anyway to include the rest of this comment with the parent body, as if I live in the days without "click and insert"? Smart is me! You guys are bringing Julius Ceasar to the game? Could you bring Spartacus too?! A football battle between Julius and Spartqcus would be too epic! Spartacus** sorry. On my phone.